A lantern orangery will flood your home with lots of space-creating light. Enjoy an orangery that looks and feels like a house extension with this stunning entry in our Ultraframe portfolio. The lantern orangery uses a 25° pitch to fully illuminate the space below it, which is delivered by an Ultrasky Roof. The system can sit on top of a deck or flat roof and uses state-of-the-art technology to deliver market-leading performance. Fox Windows specialises in installing Ultraframe conservatory roof systems for customers in Kenilworth, Leamington Spa, Warwickshire and the surrounding areas. We are approved Ultra Installers and members of the Which? Trusted Traders scheme. If you love modern orangeries, ask Fox Windows to install super-insulated columns. These features will improve the external appearance, while also making your new room more thermally efficient. The heat retention quality of these columns is five times higher than brick piers scaled to the same proportions - resulting in superior performance. You’ll have complete control over the design of your lantern orangery. A single lantern can be used if preferred; but you can also use more than one. This means you’ll be able to decide where the light falls in your new room. Turning a breakfast bar or other area in your orangery extension into a focal point is easy with this flexible system. Your lantern orangery will work as a natural extension of your home, thanks to the colour scheme you’ve chosen. You can choose one of three neutral colours that are bound to help your newly-created space blend in: black white or grey. Fox Windows will be able to help you choose the right scheme. Call now for advice and a free quote. You won’t need to make this decision, because your lantern orangery will combine elements of both. Enjoy a room that combines the solid feeling of a house extension with the light-giving properties of an orangery. Your newly-installed Ultraframe system will also reward you with a thermally efficient space designed for 24/7 living. Light plays an important part in the design of any orangery, conservatory or house extension. Our Lantern Orangery is no exception. 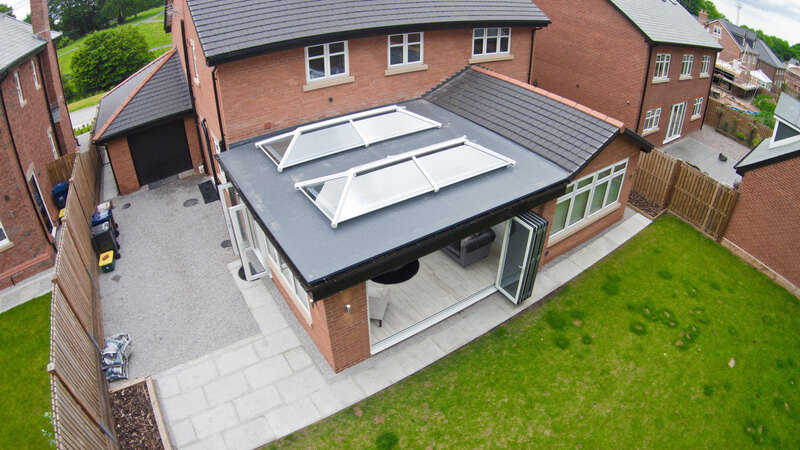 The strong ridge in the Ultrasky Roof - which is thermally efficient - requires fewer bar. This equates to better views of the outside an orangery room that feels bright and spacious throughout the year. Get that vital ‘real room’ feel by asking us to add an insulated perimeter pelmet to the design of your new lantern orangery. This feature will further prevent heat loss through your roof, while at the same time allowing you to fit spotlights and speakers. Turn your modern orangery into a room that is comfortable to spend time in all year long. If you need a lantern orangery built to a large scale, we can help. A hidden structural goalpost arrangement can be used that allows for spans up to 6.5m in width. You can ask Fox Windows to install bi-fold doors using this technology, which means you’ll benefit from stunning views year-round, lots of light and superb access to your garden. Depending on your budget – and design preferences – you can choose a uPVC or aluminium lantern orangery. Both will reward you with outstanding performance, although the latter of the two is not as heavy and will let in more light – due to less material being needed for structural strength. We will be able to help you choose the right option. Try before you buy without having to leave your home. Take a virtual step inside one of our orangeries and enjoy a 360° view. Click on features that are of interest to you to find out more about the performance of your product. External and internal views are available, so you’ll be able to take a full tour. Visit our virtual reality tool to find out more. This means we have been assessed by Ultraframe’s internal scheme and met its requirements in full. We have in-depth knowledge of Ultraframe’s products, including conservatories, orangeries and house extensions. Talk to a member of our team today or get an online quote for your lantern orangery by using our free design tool. Learn more about our lantern orangeries by exploring in VR, or get an online quote today. Fox Windows is ready to help you design your dream lantern orangery for your Kenilworth, Leamington Spa and Warwickshire home. Contact us today or, if you are busy, use our online design tool to get a quote for almost any of our products – it takes just a few minutes. Fox Windows and Doors specialises in installing high-quality windows, doors, conservatories, orangeries and house extensions. We work with leading industry partners to deliver projects to our customers’ specifications – and back up our products with incredible customer service. We cover Kenilworth, Leamington Spa, Warwickshire, Stratford Upon Avon, Rugby and the surrounding areas. You can contact us directly for advice and prices or get an online quote using our design tool within minutes.